The Spanish manufacturer of photovoltaic modules presented its product catalogue Zytech Solar, the Spanish manufacturer of photovoltaic modules, presented its products and systems at the Solarexpo & Greenbuilding 2011 International Fair which held its 12th event at the Verona Exhibition Centre from 4 to 6 May. The major new development that was presented at the event was a new glass-glass module with different coloured cells for building integration. 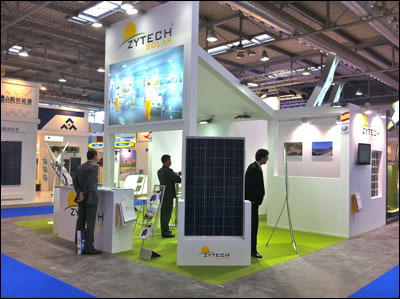 Zytech Solar presented an attractive photovoltaic .